The 1951 Melbourne Cup was won by Delta…owned by Sydney optician, jeweller and philanthropist Sir Adolph Basser. Basser migrated from his native Kracow, where he was born in 1887, to Australia in 1908. His jewellery empire merged with Angus and Coote in 1960 with Basser being appointed to the board. His love of horse-racing began with a £200 prize at the Kensington pony track in 1916.In the ten year period following WWII, Basser bought more than 40 racehorses outlaying 2600 guineas for Delta. The horse was trained by Maurice McCarten and ridden by the legendary Neville Sellwood. Basser’s investment in the yearling paid off handsomely with Delta chalking up £43,169 in prize-money. The horse won the 1949 Victorian Derby, the 1950 Victorian St Leger and in 1951 the AJC Metropolitan and the Melbourne Cup. Basser is believed to have won £50,000 in bets on Delta in the 1951 Cup. The race being run today will pay $4.6 million to the winner. Delta’s prize money was £10,000…which Basser gave to McCarten and Sellwood. 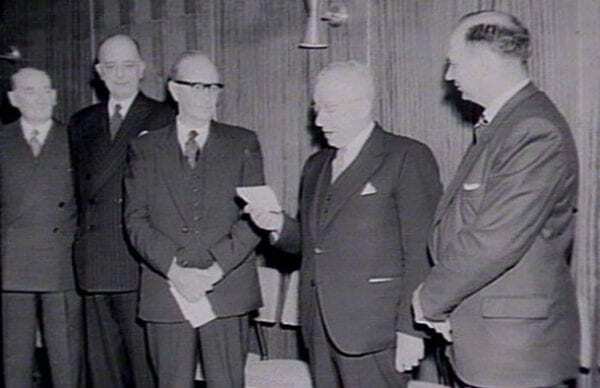 Basser remained a strong philanthropist donating £50,000 to the Royal Australasian College of Physicians, £50,000, his Melbourne Cup winnings, to Sydney University to build its first computer, £25,000 each to St Vincent’s Hospital, the National Heart Foundation and Mount Scopus College in Melbourne. He founded Basser College at the University of New South Wales with a donation of £40,000 and gave £20,000 to Melbourne’s Beth Rivkah College. Among his other favourites, Basser was a keen financial supporter of the Sir Moses Montefiore Jewish Home, the Sydney Opera House and the NSW Police-Citizens Boys’ Clubs. He died in 1964, two years after being knighted. Editor’s note: Planning for the Sydney Opera House began in the late 1940s.